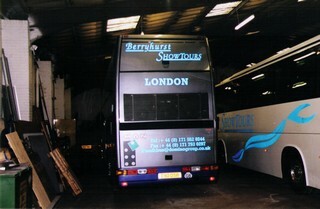 Trailways offers a complete bus and coach signage service, whatever your business or product. No vehicle is too large or too small. Here at Trailways, we know that members of the public may be interested in your products and services, but they may not see your vehicle for long enough to take away with them a clear mental record of who you are; typically, they will most certainly not have the means at hand to write anything down. Therefore, we design and manufacture your business logo and business message in a crystal clear, concise and (most of all) memorable way. With our many years experience and in-house expertise, we can design a sign and layout which will raise the profile of your business. Whatever your bus signage requirements we can deliver at a price that’s right for you! Call us today to enquire on 01922 495522.